Welcome to PlayHippo. As part of our welcome package, we will match your first deposit with a 100% bonus up to €150. Simply make a deposit of €10 or more, and your 100% first deposit bonus is automatically added to your account. We also recommend you to take a look at our loyalty clubs website - ClubHippo where you will always find updated promotions and new reload and free spin bonuses. We offer a monthly reload bonus as well as weekly free spins, so dont miss out on all the great and ongoing promotions here at PlayHippo. So just become a member now at one of the most generous and fun casinos online and on your mobile. 1. The maximum bonus amount permitted per player or account is €150. 2. This offer cannot be used in conjunction with any other offer. 3. You have to make a real money deposit of minimum €10 to your PlayHippo account in order to be qualified for the promotion. 4. Certain games contribute differently to the wagering requirement. Check out the full list of included games. 5. In order to redeem your First Deposit Bonus, you must wager 35 times the bonus amount. 6. The First Deposit Bonus can only be claimed once per person, household, family, household address, email address, credit card number, IP address or shared computer environment unless writtenly approved otherwise. 7. Failure of wagering the bonus within 30 days will result in forfeit of the bonus and eventual winnings. The above conditions are additional to the General Terms and Conditions of PlayHippo.com. PlayHippo.com reserves the right to change the Terms and Conditions and/or withdraw this promotion at any time with or without cause and with or without notice. Players are strongly advised to regularly review the related Terms and Conditions to keep up to date with any changes. 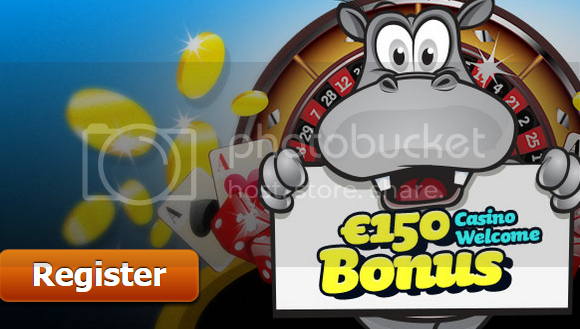 Play Hippo Casino is powered by Net Entertainment, Microgaming and NextGen softwares.